The Dublexo Sofa with Arms is a multifunctioning piece that delivers a playful, energetic appeal to modern living spaces with a mix of soft upholstery, fresh colors, and raw wooden accents. 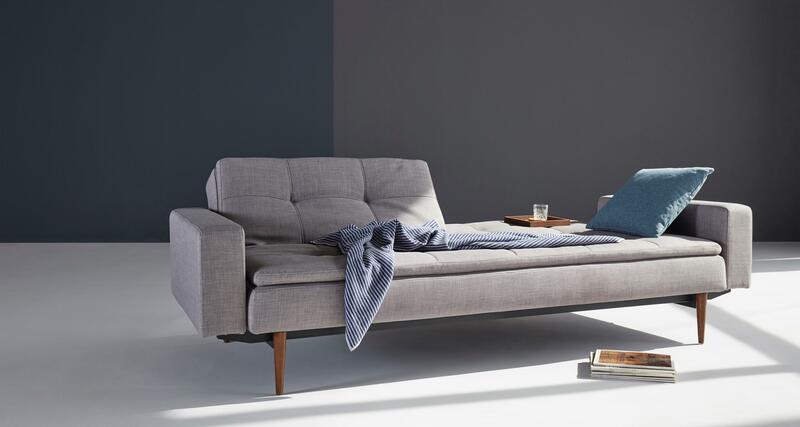 The versatile sofa features a plush pillow-topper for an added layer of comfort and the split back adjusts to full sitting, reclining or bed positions. Martindale rub count, BEGUM, over 122,000 rubs, MIXED DANCE, over 85,000 rubs, LEATHER over 600,000 rubs. Comes complete with a 7 Icomfort mattress that folds out to a sleeping surface that is 83 W by 45 deep. Want a custom color? Contact our design team to get started: 800.560.0554 or hello@rypen.com. 10 - 12 week lead time for custom fabric orders. Clean leather upholstery by wiping with a damp cloth. All other fabrics are dry clean only. Innovation Living is the renowned sofa bed specialist. They believe that form and function must go hand in hand to create innovative and durable designs for everyday use. Since 1989, they've dedicated themselves to the design and development of multifunctional sofa beds.